In a previous chapter we have discussed the doctrine of becoming clean. We discovered that it pertains to the forgiveness of our sins. There are six major doctrines that point in the same direction — to a remission of sins. Let’s put it in chart form. 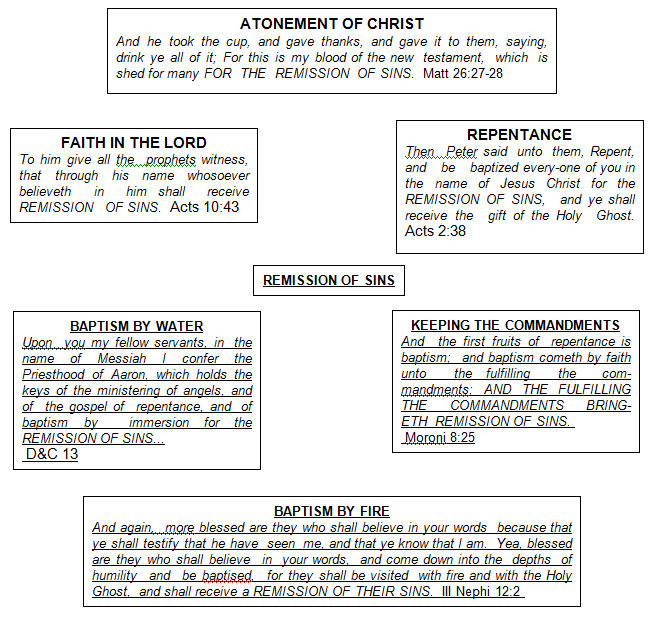 All of the above doctrines pertain to a remission of sins. Perhaps a remission of sins is more important than we might have thought. This leads us to one of the most important questions that can ever be asked. the How does Lord forgive sins? Does He forgive them one at a time? Or does He forgive them all at once? The answer may surprise you. It has been suggested that inasmuch as we sin one sin at a time perhaps that is the way that we should repent of them. In fact, that is the very approach that I took while in Korea. The war was over and I had a lot of time on my hands. I thought that a program of self-repentance would be just the bill. I‘d probably have more time while in Korea than any other time in my life. So I analyzed my weaknesses, put the worst one at the top of the list, jumped on my white charger and rode off in a blaze of glory, knowing that perfection was just around the corner. Well, you can guess what happened. Nothing — absolutely nothing. Several weeks went by and I was beginning to get discouraged because I wasn’t able to conquer the first sin on the list and would you believe that I never ever got to the second sin. When I left Korea 13 months later I was still working on the first — and not getting anywhere. Maybe I’m just weak. Surely you’ve never had any experience like that, have you? On another occasion I heard a president of an Elder’s Quorum testify that he had been using the above plan of repentance for ten long years and that he was not one bit better a person than when he started the program ten years ago. After my experience in Korea, I knew what he was talking about. Two of us in the church are weaklings. If there are two weaklings in the church who can t seem to repent of sins one at a time, maybe there are more. Maybe you are one of them. Be honest now. If you aren’t honest, you’re going to the Telestial Kingdom anyway. Now for you folks that have been successful in repenting of sins one at a time, don’t let me discourage you. Some people just have more backbone than others. If you are one of them, more power to you. However, be sure that you don’t pick up two bad habits for every one you conquer. It has been my experience that repenting of sins one at a time is very difficult. But you say, “If that method doesn’t work, is there a method that will work?” Yes, there is a better method — why not repent of your sins all at once, yes, all at once? You may as well do it the easy way. Let us assume you are a criminal and have robbed a dozen banks. Suddenly you find yourself face to face with the judge and he says to you, “Son, I’m the judge. I have power to punish you or pardon you. You can have it whichever way you want it. First of all I want you to admit everything you have done is wrong, and second, I want a promise that you will never repeat your crime. “You say that all that I have to do is confess to you my crimes and promise that I will never do them again, and you will permit me to walk out of here a free man?” And the judge answers, “That is exactly right. If you will confess every crime that you have committed and if you really mean it when you promise to go straight, I’ll let you off this time but if I ever find you in my court again I’ll exact full payment.” Not quite believing, you say, “Judge, you have a deal.” Now, can you imagine anyone turning down a proposal like that? Well, thousands or even millions of people are turning it down every day. One of the reasons is that they just don’t understand. Don’t you see? The judge in the story is the Master. Does He not have the power to punish or pardon? And who is the criminal? That is you and me. Maybe we had better get to confession before it’s too late. Why do we always have to hide our sins? Surely the Lord knows what our sins are. Why does He demand that admission of guilt? I don’t know, but one thing that I do know, is that He does. It is the beginning of repentance and it is so simple. Perhaps that is why most of us have overlooked it. What do you think Enos was doing in that all day prayer? He was confessing his sins to the Lord. The whole tenor of the Book of Mormon bears that out. What did the Lord say to the Prophet Joseph Smith? Now you’ll notice that you confess all of your sins, not just a few of them. Aren’t you seeking a total forgiveness? Why, of course. So you take all of your sins, put them in a sack. It might be large or small. You go before the Lord in mighty prayer. You open up the sack, take out the sins one at a time and lay them before the Lord in specific confession and tell the Lord exactly what you had to do with each sin. When you have confessed every sin to the Lord then you put them back in the sack, tie it shut, hand it to the Lord and humbly ask His pardon or forgiveness. Now what is the Lord’s attitude? He is eager to forgive you. He has been waiting for you to come to this point so that He could. That is why He suffered on the cross, so that you could be forgiven. Do you think that He wants His atonement to be valueless in your life? Of course not. He wants to forgive you. That will bring you under the umbrella of the atonement. That means that He didn’t die in vain. He is waiting, waiting. Don’t make Him wait too long. If this seems to be over-simplification don’t let it worry you. Just get started. Then wait for the other facets of repentance to be filled in by the Lord in their proper order and sequence. When the Lord fills in the blanks it’s done at the proper time and place for all concerned. Get excited, brothers and sisters. Revive the gift of the Holy Ghost within you and give Him cause to go to work in your behalf. Now, behold, I say unto you, if I had not been born of God I should not have known these things; but God has, by the mouth of his holy angel, made these things known unto me, not of any worthiness of myself. For I went about with the sons of Mosiah, seeking to destroy the church of God; but behold, God sent his holy angel to stop us by the way. And behold, he spake unto us, as it were the voice of thunder, and the whole earth did tremble beneath our feet; and we all fell to the earth, for the fear of the Lord came upon us. There it is. Do you believe it? The Lord, through a process of revelation, revealed Alma’s sins to him while he lay helpless. He may not have been able to move, but his mind was clear. Did you notice that prayer that he offered? It consisted of one sentence, but after three days of suffering I want to tell you that he meant every word. And how did the Lord respond? In this case of repentance it seems that about all that Alma supplied was the suffering. The Lord supplied the confession by revelation and granted forgiveness. His father and others supplied faith in the Lord, the fasting and prayer. Are you beginning to get the picture? Why repent of sins one at a time when you can repent of them all at once? In addition to the six important factors affecting receiving a remission of sins discussed in this chapter, another essential factor, perhaps even the most factor, is discussed in chapter 20.